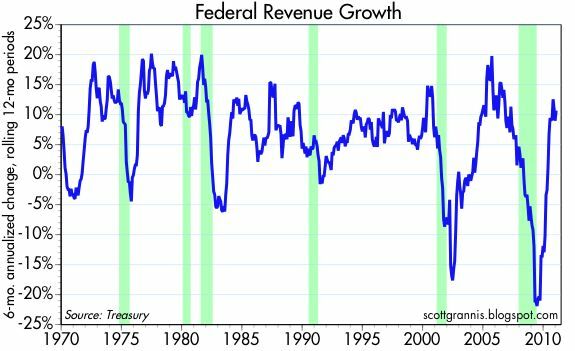 The January budget figures confirm the big story that not many have heard: federal revenue growth has been outpacing spending for more than a year. 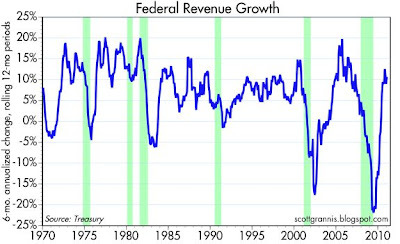 The 12-month rolling sum of federal revenues rose 10% over the past 12 months, and it rose at a 10.7% annualized pace in the past six months. Meanwhile, the 12-month sum of spending hasn't budged at all since Oct. '09. This is not an unpredictable outcome, though many have ignored it. Recoveries typically result in a slowdown in spending (fewer people receive unemployment claims) and a pickup in revenues (more people working, rising corporate profits, rising capital gains realizations). Since the current recovery began, the deficit as a % of GDP has declined from a peak of 10.3% to 8.6%, and the 12-month deficit has declined to $1.28 trillion in January, down from a high of $1.48 trillion last February. If Congress can hold the line on spending, and if the economy picks up a little speed, we could see the deficit fall to 7-7.5% of GDP by the end of this year. We would still be a in mess of trouble (adding at least another $1 trillion to the national debt as interest rates rise), but we would be making progress. Better fiscal policy from Washington would help improve confidence, which in turn would boost investment and job creation, which would then reinforce the positive developments in receipts and outlays that are already taking place. We are not at all in a hopeless situation. What in your chart of spending makes you think Congress will hold the line? A chart holds no predictive abilities to the future. It only reflects what has already happened. If you want to see if Congress "holds the line" on spending, (and even though doing so is similar to watching how someone makes sausage), watch what they actually do. It will be reflected someday, in a chart. What worries me is when govt quadruples the annual deficit, then talks about cutting a mere 32 billion from it. To me, that is analogous to graduating from 2 joints a day to 10 lines of coke, then promising only to do 9 lines. I think that Scott is right to point to the brakes being applied to the runaway fiscal train wreck, but Congress needs to apply much more than a light tapping motion. Thanks for the primer of charting. I am talking about the chart, the Congressional record on spending, what I am hearing today from Congress, and what I believe Congress will do in the future. = more Spending and yes the charts will eventually reflect this. My read of what's going on in Congress suggests a high probability of spending cuts that are meaningfully large. I think the whole mood of the Congress has changed dramatically in the past year. No one is going to want to filibuster in favor of more spending or higher taxes. The issue is how much spending will be cut, not whether to cut spending. Of course, if Congress can't manage any meaningful cuts, then we are in a real mess. There is no doubt, (and it is time for government employees to experience what the private sector has felt for two years now), cuts are coming. 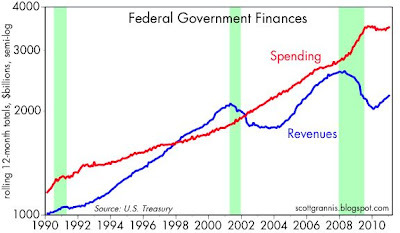 Similar to our government's balance sheet, is there not two parts to the Federal Government Finance chart? Re Bob Rodriguez: How can he know that seven months is the tipping point? That's a bit foolish. Other than that, he highlights all the obvious problems that everyone has been seeing for the past few years. Whether they lead to Armaggedon or not, or whether Congress will steer a better course, those are the questions. I don't see a strong reason to be pessimistic, even after reading everything he says. I think he's underestimating the message of the Nov. elections. Scott, I too, am an optimist - it's too depressing not to be. In light of that, I don't see the Republicans following through on their promises. If we can't cut more than 100b when we managed to suddenly increase deficits by 1500b, then I fear we really are doing nothing more than "tapping the breaks" as a previous poster said. How do we grow our way out of this, and even if we do, the govt appears to be poised to keep raising the spending baseline. Keynes doesn't work, but especially when only the spending half of the equation is applied. Not to beat a dead horse, but the House is only one part of the equation. Whatever they pass will be negotiated down by the Dems running the Senate.